7:00 p.m. The meeting is held the second Thursday of each month except December. 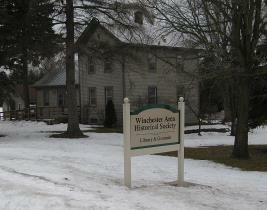 The Winchester Area Historical Society has had a long journey to its present home in Winchester. In the 1960s, some local residents who were interested in preserving their heritage began collecting information and books. The materials were kept in homes, placed in the Grace Lutheran parsonage, and later moved to the basement of the Mathison Accounting Office. Finally, on March 16, 2004, the Art Larsen property was purchased with assistance from the John and Ethel Keller Foundation. The moving began. Volunteers continue to work to improve the 6.5 acres of land and to make the Local History Center and Library more useful to the public. The WAHS facility includes a house, barn, fruit orchard, perennial flower beds, a log barn, and a farm field. The Local History Center and Library is located in the house and is open to the public. Our facilities are available for use by local organizations.